Profits at the broadcaster are up 20% as it grows customer numbers across Europe, but what's it doing about BT? On the face of it, Sky has had a good news day. Profits were up 20% to £1bn over the last nine months, while customer numbers continued to grow to 20.8 million across Europe, sending the share price up 4.5% to £10.99. But if you went to its head office in Isleworth, you’d be unlikely to find any complacency. Sky is locked in a bitter struggle with BT and others in the telecoms sector, as the walls that once separated landline, mobile, satellite TV and broadband crumble. Firms have recognised that combining these different services into ‘quad-play’ bundles could be a great way to ease the intense price competition that has characterised the sector in recent years. A scramble to get there first has ensued, with broadcasters invading telephony and landline providers getting fast into TV. BT has stolen the lead, under the leadership of new boss Gavin Patterson. It recently bought mobile operator EE for £12.5bn, making it a major force in landlines, broadband and mobile. Sky had hoped to buy O2 before it was beaten to the post by Three owner Hutchison Whampoa, but that hasn’t affected an alliance Sky made with O2 before the sale. From 2016, its European customers will be offered Sky mobile via O2. For the time being, that seems to be sufficient for boss Jeremy Darroch, who told analysts Sky had a busy enough year without having to worry about creating its own mobile service. ‘Steady as she goes,’ he said. Sky may be behind somewhat on the mobile front, but in TV it’s still the one to beat, with 15 times more subscribers than BT. Competition is stiffer in Italy and Germany, but the real challenge is from online providers like Netflix, which is thought to have more than two million subscribers in the UK alone. Sky is growing its own Sky Go service, but will surely realise that its heartland is under threat. Sky’s response has been to work on its own original TV shows like dark Arctic drama Fortitude (take that House of Cards) and to make sure it has the choicest sporting contracts, like the Premier League and the Bundesliga. All this – and indeed the move into quad-play itself - is designed to reduce ‘churn’, a measure of disloyalty in the face of competition. 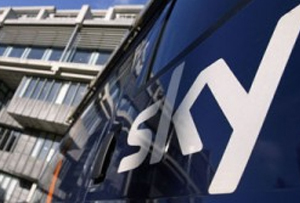 Sky’s churn rate fell from 11% to 10.8% over the last nine months, which will have helped it grow its customer numbers in its core business. Of course, another way to reduce churn is to make it hard to leave even if you wanted to, which appears to have happened to one unfortunate customer. Gavin Hackwood apparently spent 96 minutes in a gruelling live chat trying to cancel his subscription, before finding out that he couldn’t cancel more than one satellite package on the same day. That may well be an unusual case, but just imagine going through that times four. Hurray for quad-play.